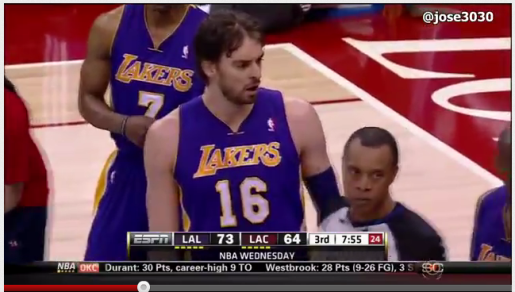 Pau Gasol has no idea what just happened to him. Gasol was a crucial piece of the Lakers’ 2010 title team, but he’s not known for his defensive prowess. Still, when Blake Griffin is looming over you ready to rearrange your worldview with a basketball to the brain, maybe you should just duck and cover, rather than rising to the challenge and trying to D him up. Give him credit for trying, but give Blake more credit for shrugging him aside with a forearm and ruining the rim with a slam.